Note the different date - a week later than normal due to the 4th of July holiday. Topics will include an update on the recently completed stocking, and various activities that the Club has been involved in over the recent weeks. We are also working to get Dan Wilson, DGIF Biologist in for a talk, but as of the time this went to press this has not been confirmed - if we are not able to secure Dan for July, hopefully we will be able to in the not so distant future. Also, you can always check the latest calendar of Club events on the Club Website (www.SmithMountainStriperClub.com) for any changes or additions that may occur. It has been a very busy few months with lots of opportunities to get involved with the Club. A number of events have been covered thus far, but we do not want to overlook other events that the Club has been involved in. A sampling of pictures from these events will be scattered throughout this issue. Thanks to ALL Club members that have participated and helped to make these events a success. It has been a very busy few months for the Club - lots of events & activities. 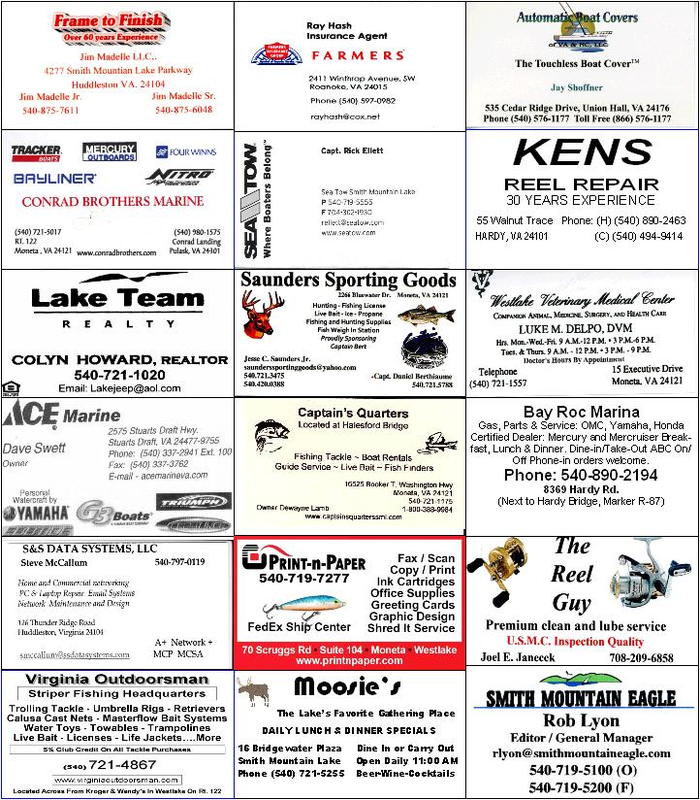 Since the last newsletter the Club hosted or participated in Lake Clean-up Day, Freedom Alliance event for wounded soldiers, the May Member-Guest tourney, our 2nd Annual In-Water Boat Show, Club meetings, 4H Camp fishing, Stocking, Bedford County Kids Day, DGIF Fishing Clinic & a trip for the winner of a Kids Fishing Derby. Wow..... I'm tired just typing all of that and I bet I missed at least one event. There is certainly no excuse not to find something that you can jump in and participate with. We will try and cover a bit of all of the above in this issue to give you a taste for what all the Club has been involved in recently. However, instead of just reading about these events, consider jumping in and getting involved in them - all of these events are fun ways to get involved with the Club in the community and many of them can be personally rewarding in various ways. Also, as always, we'd love to have your contributions to use in the newsletter & website - submit pics of your fishing trips or even better, a short write-up of the day - or even your suggestions on articles or topics you'd like to see covered. 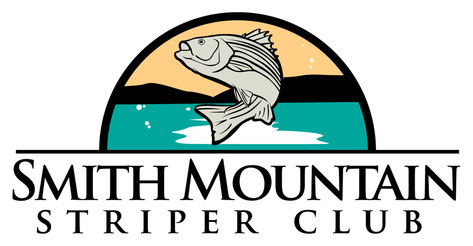 And have you checked out the Club Website (www.SmithMountainStriperClub.com) & Discussion forums recently? Lots of interesting information is added and updated multiple times a month. Members are posting fishing reports on the discussion forums, along with tips and techniques - if you've not been to these on-line resources you are missing out on a positive benefit of the Club. Here is hoping that your summer is enjoyable and that you get a chance to spend some time on the water! May's meeting featured a presentation by member Bill Pecoraro on water safety. Bill presented some sobering statistics related to drownings such as the fact that 1.2 million people worldwide drown each year - that is two people per minute and six of those people died in SML this past year. How quickly a nice day around the lake can turn deadly. Another couple of facts - 50% of drowning occur with 6 feet of safety - 90% within 20 feet of safety. In a life saving emergency, the correct procedure in making a rescue is to Reach, Throw, Row and only Go with assistance. Bill covered how every day items can be used to save lives when things go bad - the use of things that are naturally found around a dock - ropes, poles, oars, bumper tied to rope for throwing and retrieving if needed. Prepare for potential events before they occur. Position rescue objects around the docks, set rules such as children must have life-jackets on before stepping on the dock, no swimming under the dock without supervision, assign one person to keep track of all children at all times, etc. Know safe diving depths - a minimum of 9 feet depth when diving from a water level floater or pool side; a minimum of 11 feet is required when diving from a dock or board 3 feet above the water; and a minimum water depth of 16 feel is required when diving from a dock's rook or off an elevated party deck. June's meeting hosted a pot-luck of topics. Bill P covered a few additional items on water safety that he had left out of his May presentation and a couple of members shared personal stories of recent events on the water that could have turned bad had it not been for the use of life jackets. The winners of the May Member-Guest tournament were presented with their plaques. Several of the winners in the March & May tournament shared their techniques that helped them place in the tournaments. Joel covered the many Club activities that were upcoming, including last minute logistics for the In-Water Boat Show that was set for the next day. Then, members demonstrated various techniques for throwing cast-nets - with some being more successful in a "pancake" than others. A number of new items have been added to the Ship's Store recently. We have a new line of Club T-Shirts, featuring a patriotic design of a striper over the American Flag on the shirt's back, along with a single-color version of the Club logo on the front. These are available in short & long sleeve versions and in a variety of colors. The short-sleeve shirts feature a "pocket-T" and sell for $14/ea while the long-sleeve shirts (sorry, no pocket on the front) sell for $18/ea. We also have a variety of Club stickers for sale - the color Club logo sticker for $2/ea and several oval stickers at $1.75 ea. Finally, there are a few Club Flags remaining for $15/ea. Other items are in the works - hats, other shirt designs and such - and we welcome your thoughts on items you would like to see featured in the Ships Store. If you have a specific size/color request and it is not currently available, you can pre-order that item - just contact Bob Rowe. 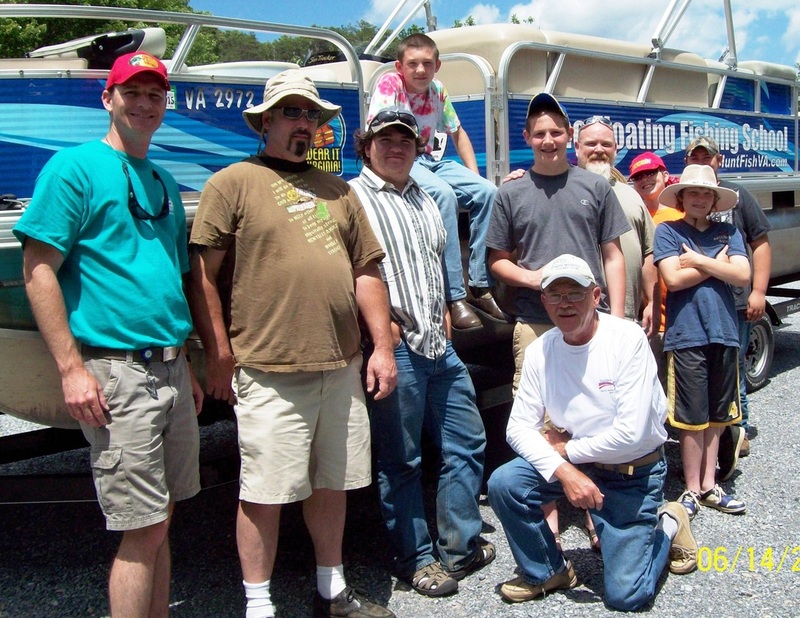 On June 8th the Smith Mountain Striper Club held our 2nd Annual In-Water Boat Show. While the weather earlier that morning was threatening, Mother Nature shined on us and blue-skies prevailed, along with temperatures MUCH more pleasant than those of last year. Around 12 Member boats were represented at the show and it included pretty much the full gambit of water craft - a 17' flat-bottom skiff, deck-boats, dual-consoles, cuddy cabins, a deep-V center console, bay boats and a pontoon. The USCG-AUX was on-hand to conduct courtesy safety inspections on member boats, our friends from Sea Tow where also there participating in National Marina Day, and a number of visitors stopped by to learn a little about striper fishing and the Club, while members exchanged a few fishing stories and shared rigging tips with each other. We continued our 2013 Tournament Series with another well participated event. After dodging the "Go Fast" boats during the Poker Run, Mother Nature tried to drown us out about time for the check-in and thus we don't have many pictures to share, but we still had good Club participation. 1st - Chris May - 63.75"
2nd - Macky May - 62.25"
3rd - Mike Ward - 57.25"
1st - Steve Nagel - 53.25"
2nd - Don Hutchinson - 50.5"
1st - Robert Bartnett - 26.5"
2nd - Barret Brown - 25"
Big Fish honors again went to Chris May, with a 33" catch. 1st - Chris May - 124.2"
2nd - Macky May - 119.5"
3rd - Michael Ward - 109"
4th - Mark Melius - 66.74"
5th - James Gray - 62"
6th - Bob Rowe - 42.25"
7th - Lee Brown - 24.25"
8th - Ken Ulrich - 21"
9th - Gary Disbrow - 19.75"
1st - Don Hutchinson - 105.25"
2nd - Steve Nagel - 74.75"
3rd - Joel Janecek - 57.25"
4th - Bill Nash - 32"
Our July 20th tournament is fast approaching. The deadline for registration is July 12th. 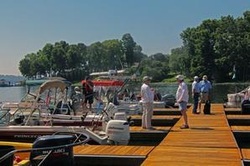 This tournament has been designated as a "Harvest Tournament" with fish contributed to be used for a Club Fish-Fry at the August meeting a few weeks later. Please still take pictures of your fish to submit as this will make check-in go a lot quicker & smoother. Additional information, registration forms and tournament tokens (and measuring devices for Series participants) will be available at the July 12th Club meeting. Additional details and the full Official Tournament Rules will be published in the 2013 Tournament Rules and posted on the Club's website (http://www.smithmountainstriperclub.com/tournament-info.html) and the Club's Facebook page. Any questions can be directed to this year's tournament co-directors - Mark Melius (mytoyzfishing@gmail.com; 540-597-8710) or Rick Boettcher (jrboettcher@cox.net; 540-761-3549). A few pictures from the tournament are below, and you can see more on the Club website. I am a native of Salem, VA. I left Salem after graduating from Andrew Lewis HS, ended up in the Air Force for 6.5 years, then moved to Cedar Rapids, Iowa and lived in Iowa for 29 years. I worked at Rockwell-Collins Intl as an Engineering Lab Tech., Real Estate, Defense Contract Admin. Services as a Quality Assurance Specialist and Quality Auditor for ISO 9000-2K and started a computer company. I have a BA from Suffield University in Quality Systems Management and Accounting. I was a fisherman during those years, mostly freshwater. Before returning to Virginia, 11 years ago, I was working as a contractor for a company who worked for Homeland Security and continued that job here in VA when I came home. Just about 6 years ago I became a professional Scouter, District Executive for the V-Da-Li District of Franklin Co and southern Bedford Co and I just retired in October of 2012. I am currently the Vice-Commander for American Legion Post 111, a Unit Commissioner with the V-Da-Li District and recently certified as a National Trainer for "Time To Teach," a classroom management system for schools. I started with the Club over 3 years ago due to Joe Wolf who was working with me in Scouts. Joe and I have become good friends and fish together quite a bit. During my time in the Club I have served as Secretary on the Board as well as the Membership Committee Chair. Macky May helped me to catch my first Stripers at the lake and I am having a lot of fun with the club and the good people in it. One of my favorite SML fishing stories is the day that I fished with Macky and and I hauled in 14 of the 16 fish we caught that day. Macky wanted to make sure I had plenty of experience bringing them in for the first time. To date my largest striper on SML is 8 lbs / 27", but I'm ready for that citation! Remember, the latest information is posted on our Club Website and on the Club Facebook page. Below are some pictures of Member Catches over the last few months. We all love pics, so please submit yours - you can post them to the Club Facebook page, or send them to smsc@SmithMountainStriperClub.com. Gabe Christie says Crappie can be fun - and they taste good too! For the third year the Smith Mountain Striper Club had the honor and privilege to to host a group of recovering soldiers participating in a retreat sponsored by the Freedom Alliance. Servicemen and women from Iraq, Afghanistan and Vietnam conflicts were represented in this year's event. The event kicked off with a barbecue on Thursday evening at Westlake Waterfront Inn and an evening cruise conducted by a few Club members. All participants were presented with a custom Striper Club sun-blocker shirt featuring a patriotic image of a striper over a flag and the Freedom Alliance logo on the front pocket. Bright and early the next morning about a dozen recovering soldiers and their significant others paired up with their SMSC "captains and mates" for a day of fishing and relaxation on Smith Mountain Lake. Our event corresponded with the striper spawn and Craddock Creek seemed to be holding millions of fish - so most of our crews headed down the lake in hopes of finding lots of hungry fish to keep our guest busy. The fish were found but unfortunately many of the fish had other things on their minds and the bite was much slower than we had hoped for. However, all but a few crews found at least a few fish, with a couple having a pretty respectable day. Mid-day out guest and crews were treated to pizza & beverages on-the-house at Mitchell's Marina and then the the groups gathered back at the Westlake Waterfront mid-afternoon and then for a relaxing dinner sharing some Mexican food at Indian Point Marina. As with previous years, this is an event that carries as much reward for our Club members as it does for the group participating. It is truly an honor to be able to serve, even is such a small way, those that have served us and given so much to protect our freedoms and ideals. We thank the Freedom Alliance for the opportunity to participate and thank the Club members who gave their time and made their boats available for this important cause. The 2013 stocking is complete with approximately 350 thousand new striper making their home at SML. Stocking occurred over 5 different days from May 31st to June 20th at 11 locations across the Roanoke & Blackwater arms. The stocking came from two hatcheries - with Bookneal (Vic Thomas) back on-line and the new hatchery manager participating in this year's stocking. The average size of the released fish was 1.32". Leesville Lake received approximately 84 thousand new residents on June 6th, roughly evenly distributed across three stocking locations, with an average size of 0.75". Thanks to VA-DGIF for their on-going stocking efforts, as well as those SMSC members that participated with the stocking to provide oversight on the stocking / release conditions. For those of you that don't know, the Striper Club tags along with the stockings as much as possible to provide oversight and a check & balance to ensure that the DGIF crew is following their procedures with the stocking - acclimating the stocking tank to that of the lake water (temp, pH, etc) to minimize the shock to the fish in the transfer, as well as ensuring that the fish are being distributed across the locations per the plan. Apparently in years past before the Club performed this role, there were issues will all the fish being dumped in one location as it was quick and easy, and that does not lend itself to very good survival rates for the stocked striper. 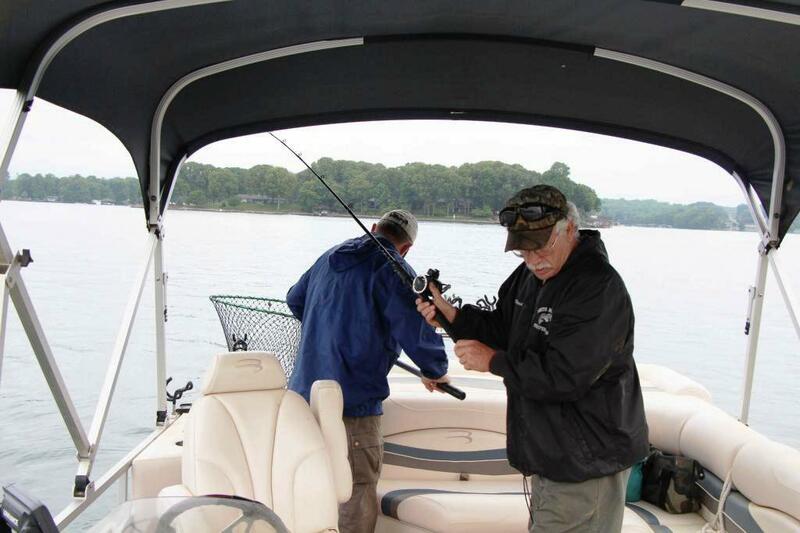 Anyone that has fished Smith Mountain Lake for more than a year or two knows that come some time in July there are a couple of locations on each of the river arms where you can be guaranteed to see the "striper fleet". On the Roanoke side, Becky's and Betty's is traditionally one of these spots where at times it seems you can walk from one creek to the other just by stepping from boat to boat. Why do so many striper anglers congregate in these areas year after year - well, because the stripers have traditionally schooled up in these locations year after year. But WHY? Why is it so predictable that the striper will congregate in these areas year after year? Well, there are a number of factors that create a comfortable environment for striped bass and if you understand these factors you can better understand the reasons why the fish are found where they are. Obviously, stripers are in an on-going search for food, and will be found near the location of significant populations of bait fish. However, the surrounding water has to also meet various conditions that are conducive to their well being. 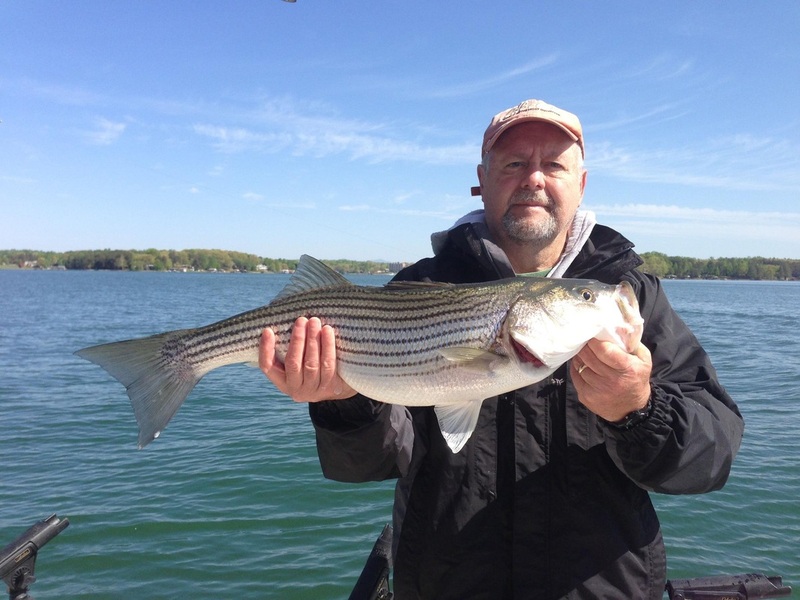 According to VA-DGIF Biologist Dan Wilson, in general, adult stripers require water that has temperatures less than < 77°F with Dissolved Oxygen (DO) greater than 2 mg/L to maintain good health and growth. That does not mean that stripers can not periodically enter water warmer than 77° (i.e. foraging for a few minutes) , they just can not stay there for very long. Young fish do not require water as cool and striper up to one year olds can handle a lot warmer water and ages 2-3 can handle a little warmer without major impacts, but the older fish (≥ age 3) really get hit hard from warm water. There is deep water up and down the lake - so why are the fish congregated down the river arms some distance and not well distributed throughout? While the striper like to be cool, they also need to have an ample supply of oxygen to sustain them. As Summer wanes on, the thermocline develops in the upper ends of the lake. A thermocline is seperation of distinct layers of water with different densities. The thermocline is generally represented by a rapid change in temperature across a relatively short change in depth. In Smith Mountain Lake, the thermocline is generally mostly established by mid-July though it can vary in timing and intensity depending on a variety of conditions such as atmospheric temperatures, rain fall, lake hydraulics, etc. With better quality sonar you can typically spot this thermocline, usually in the 20-30' range, on your sonar as a very thin "line" on the screen. You should not confuse this with a larger swath of "noise" on the sonar at depths that is 10', 20' or more in thickness - that is often mud after a large rain, leaves in the fall, etc - rather a thermocline will be seen as a very thin line no thicker than a few feet. In most years, on the Roanoke side the thermocline will be well established on the upper end of the river arms, and down to the Indian-R47 vicinity - give or take (and equivalent areas on the Blackwater), as well as inside of shallower creeks. So why all the discussion of this thermocline? It is because this establishes a lower bounds in which the striper have a comfortable environment to thrive. Once established, transfer of oxygen between the layers of water above and below the thermocline is restricted. The oxygen below the thermocline is limited and begins to decline. So we encounter a scenario in which the stripers are literaly "squeezed out" - the water which is creeping downwards from the surface while the thermocline creates a "floor" at which below there is not enough oxygen for the fish to thrive - and as such they are squeezed into a limited range of preferred conditions. 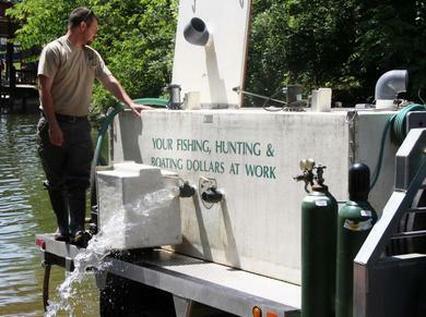 In some bodies of water this "Summer Squeeze" presents a serious problem and is what leads to fish kills year after year. Fortunately Smith Mountain Lake has conditions in which the fish are able to escape this squeeze by moving down the lake, down to where DO levels stay at an acceptable level (and where a sufficient amount of forage remains). If we can establish the area in which the thermocline fades out (or at least where the DO levels below the thermocline remain at acceptable levels), and we understand the temperature profile in the upper depths of the water column, then we can begin to narrow down the regions of the lake where the fish are likely to be holding. So now we understand where the fish are likely to be and why, and with the right bait or lure and a little luck we end up with one on our line. As many anglers have adopted catch & release practices to help preserve and foster our larger fish it is our inclination to continue this practice year-long. However, it is very important to understand the impact that warm water temperature has on striped bass during and after being caught. During the process of catching and fighting the fish to the boat, the striper is expending tremendous amounts of energy. Lactic acids are building up in the fish's muscles and high levels of stress are accumulating. The longer the angler fights the fish, the more stress the striper experiences. When the fish is released the build up of this stress can result in its demise - often even if the fish appears to swim away. A number of studies have been done on various bodies of water to try and quantify the variables. One often referenced study indicated that as suface water temperatures reach 80 degrees, the mortality rate for Catch & Release approaches 50%. These various studies all have factors which can raise questions regarding the methods used and their applicability to any specific body of water, but overall there is no debate among the community of biologist that higher water temperatures lead to increased mortality rates of released fish. It is also fair to point out that the survival rate of a fish put in the cooler, regardless of water temperature is an absolute 0%. Due to these warm-water C&R survival rates, it is often recommended to limit your amount of summer-time striper fishing - or catch your limit and call it a day (or perhaps switch and chase catfish, bass or other warm-water tolerant species). If you or your family enjoy eating striped bass, then this is the time of year to consider stocking the freezer to then enjoy a nice meal during other seasons in which C&R is preferred. Also, when you do harvest those fish, consider lopping the heads of the fish off and dropping them off at a collection site to be used by DGIF in collecting the oolith bone which is used in aging the fish - this is valuable data to help manage the health of our striper fishery. If you do choose to practice Catch & Release during the summer, use techniques to minimize the stress incurred on the fish - use sufficiently heavy tackle and line to minimize the duration of the fight and then unhook and return that fish to the water as rapidly as possible - leave the photos to the cooler months. Finally, consider the depth from which you are catching the fish - if you are catching the fish from 50' or deeper, the rapid accent to the surface will likely result in their air bladders to inflate from the rapid change in pressure. It is not recommended to vent striper like can be done with certain other species - so if you are targeting fish at these depths consider putting them in the cooler and then calling it quits for the day when you reach your limit. Ultimately this is an individual decision that each angler must make, and as long as you are acting within the bounds of the current regulations and laws then you are fully in your rights to make the decisions you make. However, better understanding all the factors and facts that play into this discussion helps each angler to make better decisions for the fishery. 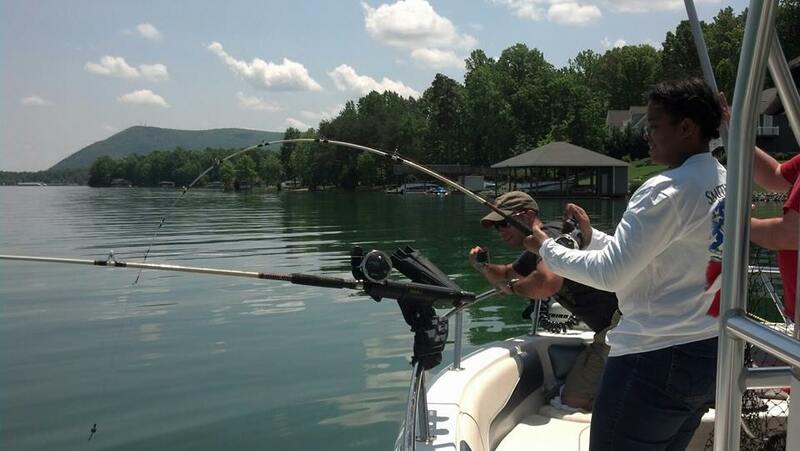 I have fished for stripers at Smith Mountain Lake for two and a half years since buying a condo at Bridgewater Pointe. I have a home in Southwest Roanoke county as my primary residence but am at the lake as often as possible and spend time in FL during the cold water months. I regret not realizing long ago that Smith Mountain Lake is a great fishery. I have enjoyed fishing all my life and caught stripers in the Chesapeake bay in the early 80's. I would say that Joanne, my wife of 34 years is one of my closest fishing buddies although you would not know it when we are out there on the water. She caught a 20+ lb striper in the bay years ago while 6 months pregnant. We both are anxious to learn more about striper fishing. We have 7 grandchildren, 6 girls and a boy. Our boys live in Roanoke and Salem our girls live in West Virginia. For years I was in the Bird business - that is raising game birds, pigeons, ducks, peafowl,etc, as a hobby that took up all my time. Now when I'm not fishing I am thinking of going and where. During the cold weather months I spend time in Bradenton, Florida. It is on the Gulf coast south of Tampa and north of FT. Meyers. I do really enjoy it during the winter and fish the surf almost everyday. Don't do a lot of catching, some flounder, Spanish mackerel, bonnet head sharks, sheepshead and small stingrays. I have a small 14' aluminum boat I use for freshwater mostly for crappie and catfish down there. I have been with the Club for 2 years and currently hold the position as Treasurer on the Board and also serve as Tournament Co-Director. I generally fish mid lake and around / in Betty's and Becky's creeks. I typically use mostly live bait but have tried my hand at jigging. I would like to do more umbrella-rig trolling, but I am just not very confident with it. My biggest striper on SML was a 33" fish caught in Gills creek. I am very interested in improving the SML fishery and looking to work with the DGIF in the stocking program to improve survival rates. I fish from a 20' Hurricane deck boat - green and white with Mercury power. I like to fish anytime but feel late summer is the best time. I have a lot to learn about SML Stripers and as well as how to better throw a cast-net. I am always ready to listen to any suggestions. So as I start to circle around I started seeing schools of fish. WOW. I made one lap of the creek mouth and saw more fish than I've seen all Spring. There were bunches and bunches and bunches of fish!!!!!!!!!!!!!!!!! I had crank-baits out but nothing was biting. So we tried umbrella rigs for a couple laps. Nothing. FRUSTRATING!!!!! Tried Alabama rigs for a couple laps. NOTHING! It was beyond incredible to see that many fish and work them for 1.5hrs + and not get a single bite. By now it was nearing noon and Jason needed to head back to the office. Since we were in the area and Jason hadn't seen it yet I cruised him past the Osprey nest for a peek at the birds, just a little side point-of-interest. That's it. I got him back to the ramp and then went for the temps. I did so much "fish" talking today that I'm losing my voice. Tomorrow is another big day with Darius Minnis, a winner in the Aspiring Anglers fishing contest sponsored by the Friends of the State Park. I really hope we do better than today. ps. Cleaned the bait tank as soon as I got home. It even smells good now.